ÅF recently helped transform Oslo’s first railway station Østbanehallen into an attractive food court and city centre shopping haven. Last night, they won the International IALD Lighting Design Award at a spectacular award show in San Diego. At the 33rd annual IALD International Lighting Design Award ÅF has been recognized as setting an example in lighting design excellence for their lighting design in Østbanehallen in Oslo, Norway.The IALD International Lighting Design Awards program is the longest running award program recognizing architectural lighting design excellence. 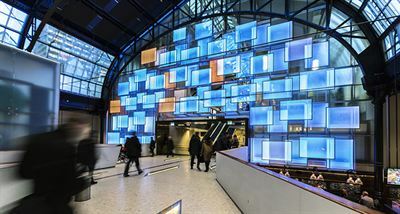 ÅFs team has designed a complete lighting solution for Østbanehallen, including functional lighting for the entire hall as well as especially designed lighting solutions to create a unique and pleasant atmosphere. When it was first built, Østbanehallen had an open east facing façade which allowed the light from the rising sun to fill the great hall. The new lighting design features a striking pixel wall which once again makes light and sunrise part of the building, symbolizing the beginning of new days and new journeys. This year, from 207 submissions, the judges selected thirteen entries to take home Awards of Merit.